I’ve been dying to share our Austin studio tour with you all and I couldn’t be more excited that this day is finally here. Before I get ahead of myself, though, let’s talk about this move, shall we? The only thing I can really compare it to is having baby. 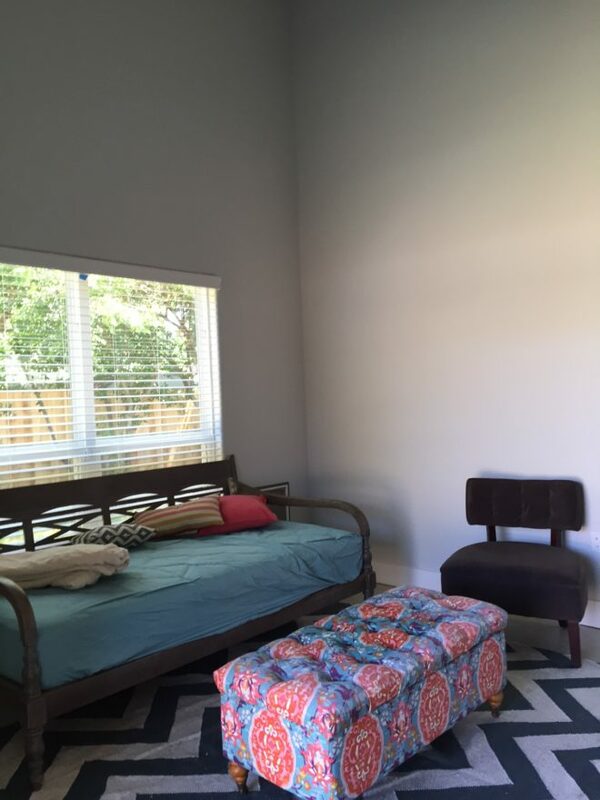 In my mind, of course I knew that moving our family across the country, deciding to build a house from scratch, and deciding to shack up with my parents in Georgetown until said house was complete would be a transition, but I couldn’t possibly understand what that would feel like until we were in the midst of it all. It’s the same thing when people try to prepare you for having a baby. You are fully aware that you will be exhausted and emotional and all of the other things, but there is almost no conceivable way to really wrap your mind around it until you’re in it. So, here we were, two months ago, living in Austin (well, actually Georgetown) and trying to continue with business as usual. Meanwhile, so many of my props and other resources are still in storage and we are trying to impose as little as possible on my parents. It took all of about two weeks to realize Aaron and I were going to need an Austin studio space for work. One more time, because it’s just so gratifying! 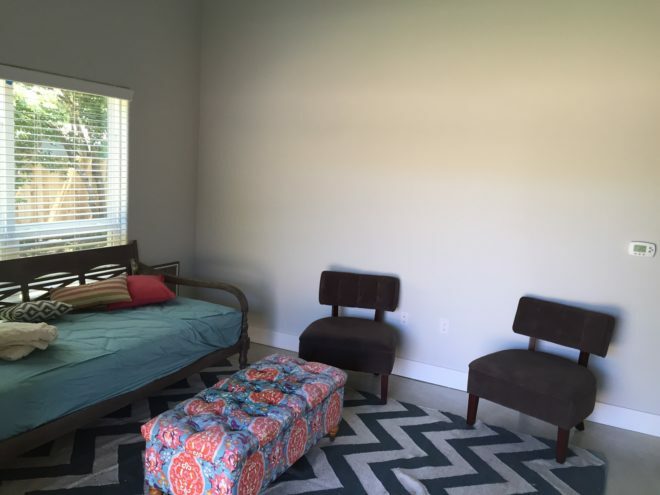 For starters we gave that extra tall 14 foot wall a major makeover with a pink coat of paint. I knew right away that I wanted to swap the positions of the sofa and chairs. The sofa blocks so much of that big window. Plus the pink wall is much larger so it just makes sense scale-wise. 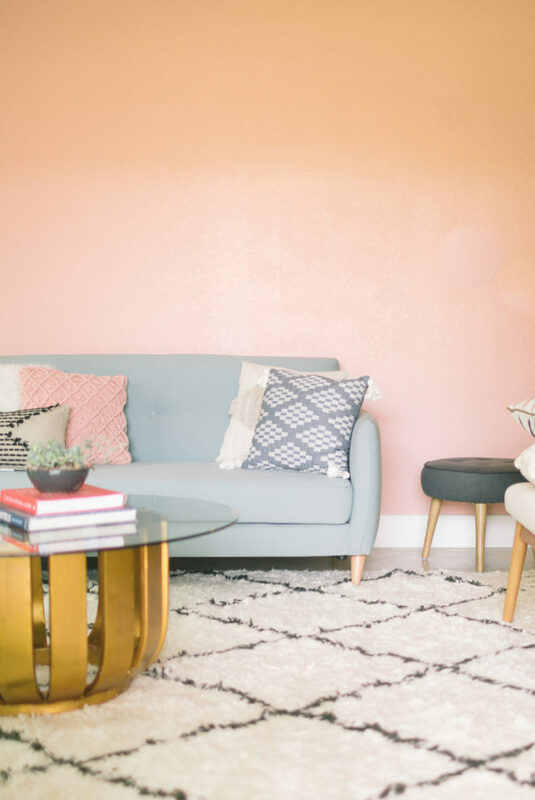 I think this sofa is the perfect color complement to that pink wall! It makes me seriously happy. 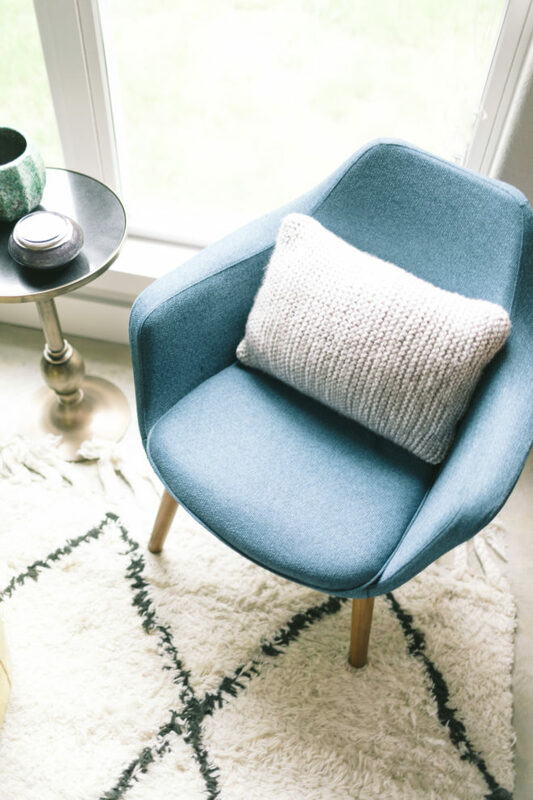 There was so much wood and upholstery in the room with the chairs, the sofa, the tufted bench, and the ottoman that I knew I wanted something completely opposite for the coffee table. Isn’t this table the coolest?! I’m obsessed and may just have to steal it back when our house is ready! 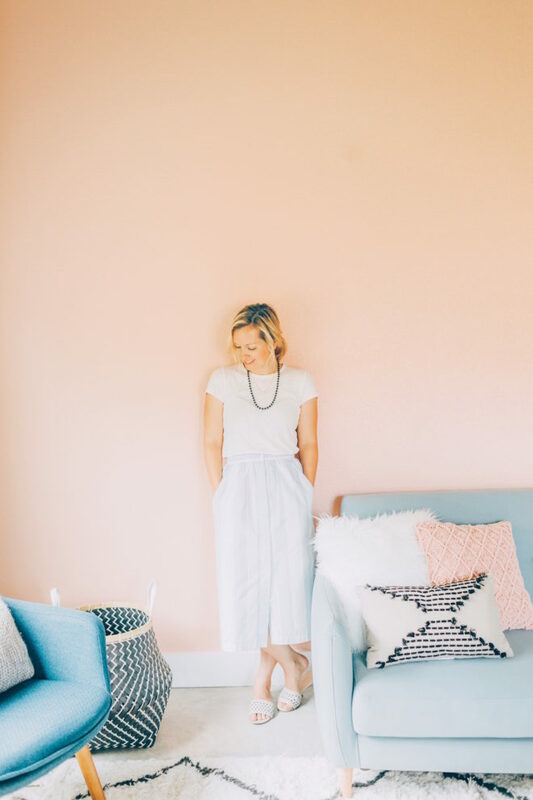 There’s something about all of the black and white prints that really ground the pastel colors, too. It makes it a little more grown up and sophisticated. 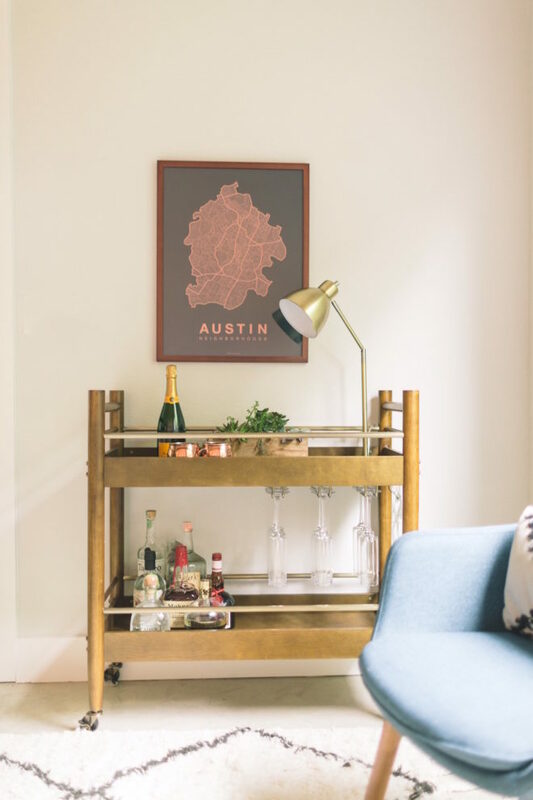 You know how much I love a bar cart! I love how narrow this one is– it almost doubles as a console table, but with a lot more storage and interest. First of all, Inez is one of my favorite names! Secondly, thank you. I really appreciate it. Absolutely! This week I feel like we have turned a corner… although, I think I say that every week! I’m starting to accept that life with young kids is just always partially organized chaos! Love this redo. So cute, and it’s so inviting with all the warn colours you chose. Great job. Thanks so much, Fatima! It makes me so happy every time I step inside! The colors in this room are so modern and timeless. Beautiful work! 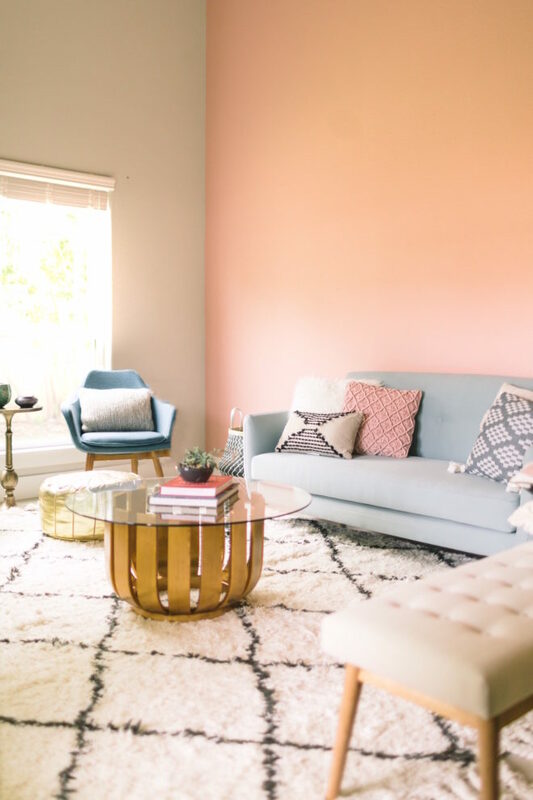 Swooning majorly over that coffee table and the pink wall! Thanks, Lexi! 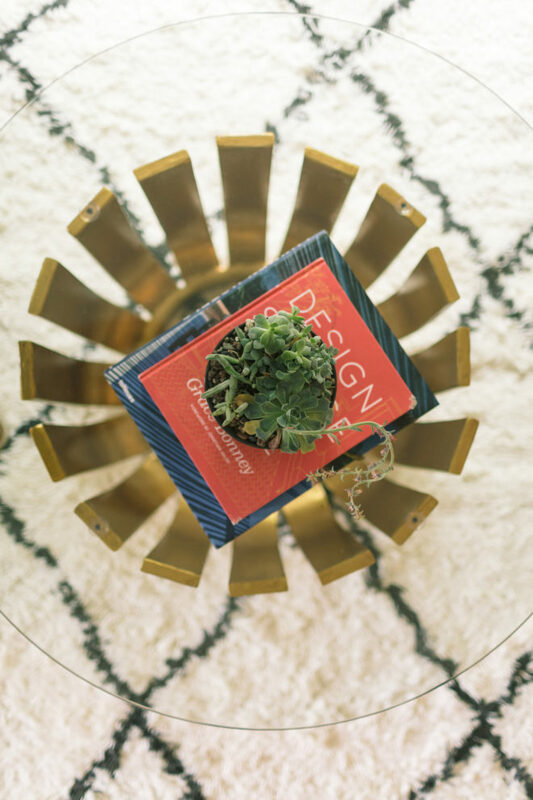 I’m so into that semi-weird, semi-beautiful coffee table. 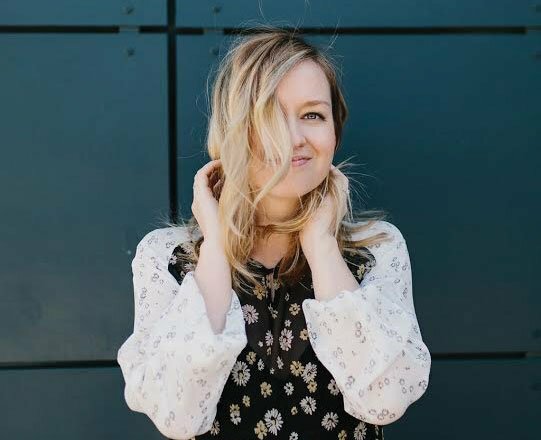 Pingback My Style || Georgetown, Texas - The Effortless Chic - A lifestyle blog bringing easy ideas for every day style to you, every day of the week! 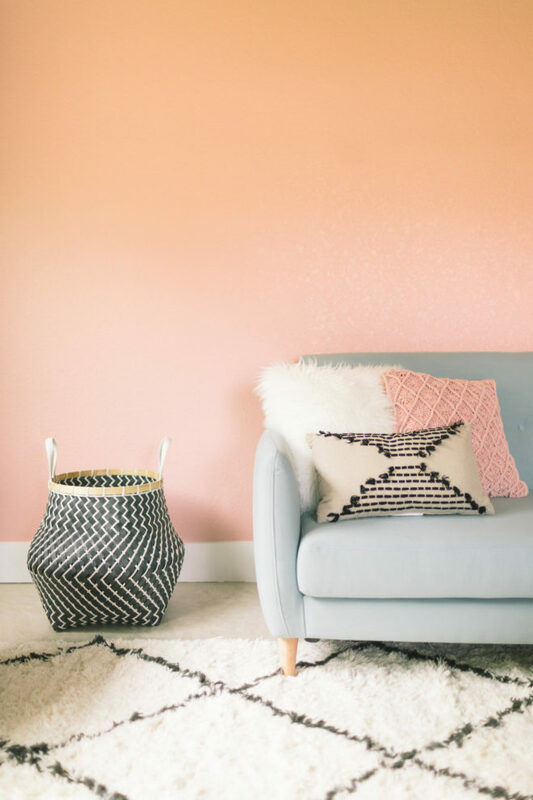 I love this pink wall! Can you redo my house?